Sandra L. Johanson (nee Skoglund) was born on January 13, 1944 in Chicago, Illinois to Eric and Ruth (nee Allgire) Skoglund. She died Tuesday, January 15, 2019 at Northwest Community Hospital in Arlington Heights, Illinois. 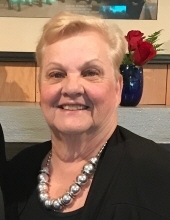 Sandy worked for 14 years as an Administrative Assistant for the Lutheran Home in Arlington Heights. She recently was a patient at the Lutheran Home working to rehab after a knee replacement surgery. She was so thankful to the caregivers and staff for their kindness during her time there. She was a member of the Arlington Junior Women’s Club and several bridge clubs. One of her passions was singing. She enjoyed singing duets with her husband Dale. She could often be heard at the Sunday church services at her favorite summer home, Svecia Country Club. Sandy was proud of her Swedish heritage and loved cooking Swedish pancakes for all of her grandchildren. She loved her 9 grandchildren dearly. Sandy is survived by her husband Dale Johanson; her children Timothy (Allison) Johanson, Kathryn (Michael) Salerno and Kristine (Jim) Somerville; her grandchildren Adelaide Johanson, August Johanson, Erik Johanson, Tomas Johanson, Vincent Salerno, Mia Salerno, Jimmy Somerville, Cyris Somerville and Linnea Somerville; her siblings David (Tina) Skoglund and Karin (Robert) Lutz. She was preceded in death her parents as well as her brother Donald (Shirley) Skoglund. "Email Address" would like to share the life celebration of Sandra L. Johanson. Click on the "link" to go to share a favorite memory or leave a condolence message for the family.